DALLAS, TX -- Founded in Abilene, TX Taco Bueno has filed for financial restructuring under bankruptcy laws. Taco Bueno Chief Executive Officer Omar Janjua issued a press release Wednesday. According to Janjua, under our new management team, "we have introduced new, delicious offerings and have been reinvesting in and remodeling our restaurants. We recently announced that we have entered into an agreement with Sun Holdings, Inc. on a plan that will position us for long-term financial health and success. Under the plan, Sun Holdings will become the owner of Taco Bueno, and they intend to invest in remodeling our restaurants, increasing brand initiatives and enhancing the customer experience." "We are implementing this plan through a court-supervised financial restructuring and I want to emphasize that during this process, your local Taco Bueno restaurants are open and eager to serve you. As always, our guests can expect freshly prepared meals made by real cooks, in real kitchens using real ingredients," Janjua said. "We truly appreciate your ongoing support and are confident that the steps we are taking will help ensure that Taco Bueno will continue to be a local Tex-Mex staple now and into the future." Taco Bueno’s first location was in Abilene and it opened in 1967. There are now 180 locations in seven states. 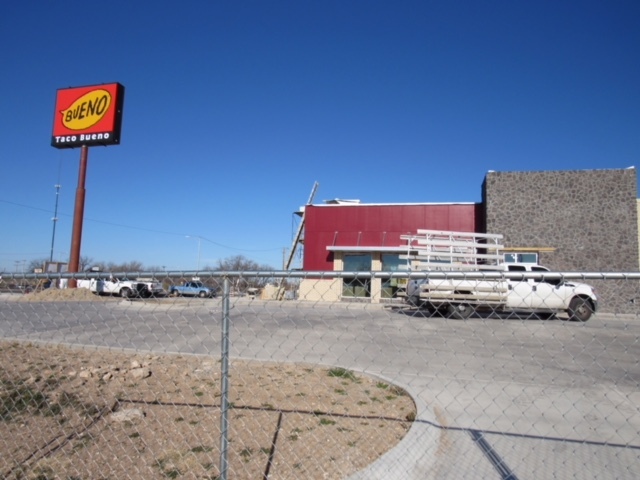 Taco Bueno built a new restaurant on N. Bryant Blvd and 9th St. in San Angelo within the last year and there is a second location under construction between Chick-Fil-A and Panda Express on Sherwood Way. Although I was a small child at the time, I remember waiting in long lines to eat there when it opened in '67. Fast food, and especially fast Mexican food, was a novelty then. That location is still operating as an independent fast food Mexican restaurant that is quite good as well. The exterior facade had a depiction of a Mexican man that would be construed as a racist stereotype now. Before that last long haul of the trip from Abilene south to Angelo, I would always stop at the one on the edge of town. It was just a chance to get off the highway and take a little break which is always a good idea on a long journey. The taco supreme was always my favorite and of course some hot sauce. I am realizing this is just a financial situation but the brand will still be around. That sounds okay. Oh, I just remembered the item on the menu called Bob is also my new favorite. It stands for big ole burrito. Drive through speaker technology is about the same when someone says that I can't hear you. Bob and a coke. What did you say? Bob and a coke, we only serve pepsi. Okay , can I have one? Which one sir, we don't understand ? Can I have a taco instead? Hello, is anybody in there? Sir, pull up to the second window, the first window was not a well thought out construction idea. Now what was it you wanted? Bob. He no longer working here. what a shame, the only two Spanish words I know are taco Bueno. Drive through speaker no Bueno.